Despite Defence Minister George Fernandes announcing last week that infiltration from across the border has almost stopped, latest intelligence information collated by the Army here reflects a picture contrary to the claims of the political leadership in South Block. The atmosphere at the state BJP headquarters was ‘Ram-may’ as saffron-clad sadhus from Ayodhya reached here to receive new state president Vinay Katiyar. Gods were invoked amidst chants of Vedic hymns so that the new president could fulfil his commitments. The battle lines for the July 15 presidential poll were drawn today after the nomination papers of “non-serious” candidates were rejected and only the nominations of NDA nominee Dr A.P.J. Abdul Kalam and Left Front candidate Capt Lakshmi Sahgal were found valid after scrutiny. The Speaker’s ornamental mace, carrying the Asoka symbol, which had its glorified place in the West Bengal Assembly since January 31, 1934, has now disappeared following a fracas inside the House over the Wakf scandal on Monday. In a major relief to farmers in Tamil Nadu, Prime Minister Atal Behari Vajpayee today asked Karnataka to release additional three TMC ft of water to Tamil Nadu to tide over the problem of shortage of water for summer crops in the Thanjavur delta. The Mumbai High Court today rejected appeals of film financier Bharat Shah and Dubai-based trader Mohammed Shamshuddin, alias Bhatija, challenging a lower court order which refused to discharge them in a case of alleged nexus with the underworld to target Bollywood personalities for personal gains. The French Government has conferred the National Order of Merit on author, publisher and journalist, Urvashi Butalia, in recognition of her contribution to the promotion of French culture in India. The Congress today expressed shock at the statement of US President George Bush asking the Palestinians to choose a new leader and promising them a Palestinian state within three months. Reliance Industries Ltd Chairman Dhirubhai Ambani, who is on life support systems, continues to be unconscious and a team of two specialist doctors is monitoring his condition today. Maharashtra Health Minister Digvijay Khanvilkar, who visited Ambani at Breach Candy Hospital here, told reporters that the ailing Ambani “is still on life support systems and a team of two specialist doctors are taking care of him. We have left everything to them”. Former West Bengal Chief Minister Jyoti Basu has charged the NDA government at the Centre with adversely affecting the state's economy. Thousands of devotees gather in Puri to witness the sacred bath ceremony of Lord Jagannath prior to a 10-day annual chariot festival. The Army authorities are perturbed with senior ministers making announcements when the fall in the level of infiltration along the Line of Control (LoC) can at best be described as “negligible and inconsequential”. To top it all, the presence of al-Qaida elements is increasing at strategic spots across the border in Pakistan-occupied Kashmir (PoK). Intelligence inputs contradict Pakistan President General Pervez Musharraf’s claims that communication stations operating from PoK have been shut down and that the Inter-Services Intelligence (ISI) is no longer providing support to the terrorist organisations wanting to create trouble in Jammu and Kashmir. Pakistan is still operating training camps for militants in various parts of PoK. The only difference is that those getting training have been asked to disguise themselves as locals and mingle with them. Besides, Pakistani army officers providing the training have also been asked to be in disguise and act as village heads. Highly placed sources here have disclosed that there has been a negligible fall in infiltration from across the border and there has been no decrease either in the number of killings in Jammu and Kashmir or in the number of incidents in the state. Since January this year, the Army has killed about 850 terrorists, which is a 25 per cent increase in their number over the corresponding period last year. This, the sources have said, has also brought to the fore the fact that infiltration has actually been stepped up, considering the increase in the number of Pakistan-sponsored terrorists having been killed. Intelligence reports suggest that there are still about 3000-odd trained militants waiting along the LoC to cross over into India. There is apparent concentration of terrorists at various spots along the border. The terrorists are mainly concentrated in the areas of Muzaffarabad, in the region opposite Poonch and in the areas of New Mirpur and Kharian on the Pakistani side of the LoC. Sources have said that Pakistan is still operating over a 150 training camps in these regions and contrary to its claims, a large number of ‘communication stations’ continue to be under use. Intercepts by the Army point out that all communication stations in Zaffarwal, Samani, Nikial, Kahuta, Kel and Tejian are still operating. The intercepts draw attention to ISI operatives of the terrorist groups passing on instructions to their cadres in Jammu and Kashmir from these stations. The instructions are for terrorists to lie low for some time. But none of the communication stations have been dismantled. Reports have also suggested that the presence of the al-Qaida cadres has been steadily increasing at various points along the LoC. The ISI authorities have been diverting the incoming al-Qaida cadres to the north of the border, rather than bringing them towards Muzaffarabad. The al-Qaida concentration has been detected in the region of Gultari, Skardu and Kel regions, where 200 to 300 terrorists have been suspected to be in hiding. The al-Qaida presence has also been detected in the region opposite Poonch, where 75 to 100 cadres are said to be in hiding. Sources say although there is no physical contact with the al-Qaida cadres at present, they are waiting to infiltrate into Jammu and Kashmir at the first possible chance along with other terrorists. The atmosphere at the state BJP headquarters was ‘Ram-may’ as saffron-clad sadhus from Ayodhya reached here to receive new state president Vinay Katiyar. Gods were invoked amidst chants of Vedic hymns so that the new president could fulfil his commitments. The function continued for over an hour, and when it ended, Mr Katiyar was taken to his office for a meeting with senior leaders. It was Mr Katiyar’s first visit to the state capital after his elevation to the post of BJP chief. BJP leaders thronged the Charbagh railway station to receive Mr Katiyar. Those who failed to make it there, reached the state headquarters at Vidhan Sabha Marg. But the sadhus, numbering over a dozen, hijacked the show. They were led by Dharmendra Tiwari, the senior priest who had carried out ‘shilapujan’ a few months back at Ayodhya. Their presence gave enough indications as why Mr Katiyar had been chosen for this job. The sadhus time and again urged the gods to give enough strength to the new president so that the makeshift Ram temple at Ayodhya could be transformed into a majestic one. Mr Katiyar remained tight-lipped over the Ram Mandir issue. He refused to talk to the media as one of his close aides told The Tribune that the BJP chief was not prepared to face the media at this point of time. Mr Katiyar was not ready to speak out his mind on Ayodhya and Ram Mandir, the aide said. “The position of Mr Katiyar has changed now. Earlier, he was identified only with the Ram Mandir agitation. Now, he looks at all political aspects before uttering a single word,” he added. Of the 54 nomination papers filed for the highest constitutional office of the country, only four nominations, two each of Dr Kalam and Captain Sahgal, were found to be valid, Returning Officer R.C. Tripathy said. As many as 49 papers were rejected for either having no valid proposal from seconders or for want of security deposit. Besides Dr Kalam and Captain Sahgal, only one nominee, Narendra Nath Dubey Adig of Varanasi, had provided the requisite number of proposals from seconders but on scrutiny they were found “not genuine.” Mr Tripathy said that he would report the matter to the Election Commission for appropriate action. While 23 nomination papers were rejected outright, 27 other nominations were declared invalid on scrutiny, leaving only Dr Kalam and Captain Sahgal in the fray. Parliamentary Affairs Minister Pramod Mahajan and Law Minister Arun Jaitley were present during the scrutiny from Dr Kalam’s side while Rajya Sabha MPs Abani Ray (Revolutionary Socialist Party) and R.S.P. 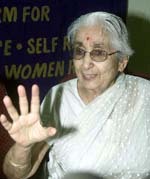 Pillai (Communist Party-Marxist) represented Captain Sahgal. The last date for withdrawal of nominations is June 28, but neither Dr Kalam nor Captain Sahgal is expected to withdraw. The Speaker, Mr Hashim Abdul Halim, has ordered the removal of the mace which had been often the Opposition’s target of snatching during their protest mark against the Speaker’s ruling. The snatching of the mace by angry MLAs in the Assembly, had been a common practice since the British Raj and when Mr Jyoti Basu was in the Opposition, the snatching of the mace from the Speaker’s desk , was a usual phenomenon, which Mr Basu himself does not now deny. On Monday, the angry TMC MLAs had dragged the mace down to the floor from the Speaker’s desk when they were protesting against the Speaker’s disallowing of their motion for a discussion on the Justice G.R. Bhattacharyya’s inquiry report on the state wakf scandal which reportedly had indicted Mr Halim himself and a few other prominent CPM leaders. Trinamool Congress and Congress(I) MLAs alleged the Speaker was now trying to protect the “corrupt CPM leaders, including himself, involved in the embezzlement of huge funds of the Wakf Board”. They demanded the inquiry report be placed in the Assembly forthwith and the discussion be allowed. In a related development, a special court ordered the commencement of trial against Shah and others from July 2. The high court also rejected Shah’s plea for quashing the framing of charges against him by the designated court set up under the Maharashtra Control of Organised Crime Act (MCOCA). Mr Justice S.K. Shah also refused to stay his order to enable Shah move the Supreme Court in an appeal. Meanwhile, the trial did not begin today in a designated court although the prosecution appeared set to go ahead with the production of witnesses. Shah’s counsel sought the list of witnesses before the trial began and the court ordered the prosecution to provide this information to the accused. The matter had been adjourned to July 2 for the commencement of trial. On May 6, designated judge A.P. Bhangale had rejected the petitions of Shah and Bhatija on the ground that there was sufficient evidence to implicate them in the alleged crime. Later, charges were framed against Shah and others on June 13. The Ambassador of France, Bernard de Montferrand, bestowed the award on Ms Butalia at a function here on Tuesday evening. Sources in the French Embassy here said the distinction has been conferred upon Ms Butalia for promoting French culture and image in India and bringing the French and Indian communities closer through her writings and critical essays. In a statement, Ms Ambika Soni, chairperson, AICC media cell, said that terrorist attacks on both sides should be stopped and the peace process resorted in West Asia. “But the onus cannot be placed only on Mr Yasser Arafat, who is duly elected President of the Palestinian people. Such a partisan stand can only escalate tensions,” the statement said. The Congress, it said, appreciated the legitimate security concerns of Israel must also be met. Reliance Industries Ltd Chairman Dhirubhai Ambani, who is on life support systems, continues to be unconscious and a team of two specialist doctors is monitoring his condition today. Maharashtra Health Minister Digvijay Khanvilkar, who visited Ambani at Breach Candy Hospital here, told reporters that the ailing Ambani “is still on life support systems and a team of two specialist doctors are taking care of him. We have left everything to them”.